Slate Black again for the “Skyline” accessory rail in black varnished aluminium, with towel rail in polished aluminium and glass shelves for the bases. Various models and sizes of mirrors and lamps complete this sophisticated range (this solution features a “Link” mirror with an “Impact” light and a “Wallmirror” light). 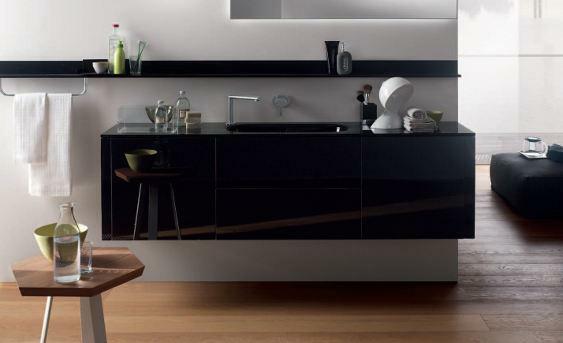 Melamine nuances in the floor-stand storage cabinet with polished Slate Black glass doors and (38 cm deep) top. The open-shelf units are in a glossy lacquered same-colour finish.